My Dad is doing ok. He has a dementing illness kind of like Alzheimer's. He doesn't talk very much but it seems he has genuinely enjoyed being with the family as we gather every few days. He watches the kids play and laughs with them and listens to our stories. He is definitely offering his presence and that is very precious to us. This past weekend, my Sister lent us her car and we drove to Chicago to Jesus People, USA for our friend's wedding. Jesus People is like being in one of the elf communities in the Lord of the Rings...you don't quite know how they do anything but it seems to work. Over 500 people all living together in Christian community and care. This is the only shot I got of the place but it kinda describes it very well. 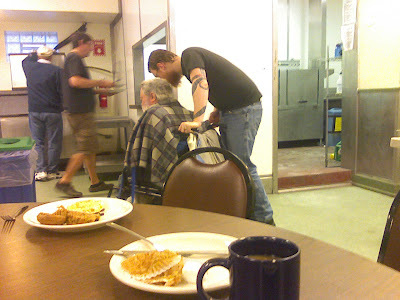 This is a shot in the cafeteria of a young guy praying with and caring for a disabled man before the church service on Sunday morning in the cafeteria. You see people of every different kind living, celebrating and working together. It's a beautiful place and a, well, magical wedding. 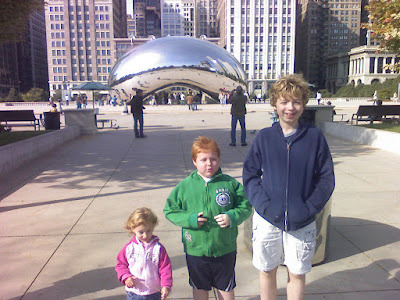 We went to see the bean. 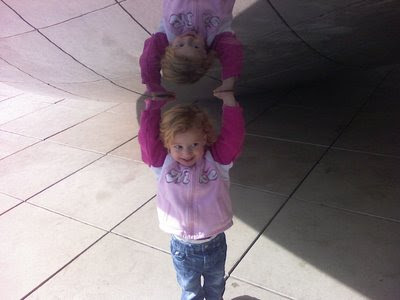 If you don't know about the bean then there's not much to say...except, here's the bean..
...we've been doing that a lot. 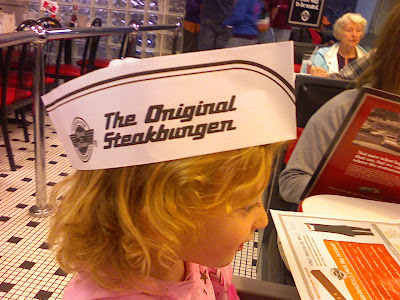 And we'll while away our last few days being with Dad and participating in church life here. We'll probably eat more and have some campfires and enjoy the fall. 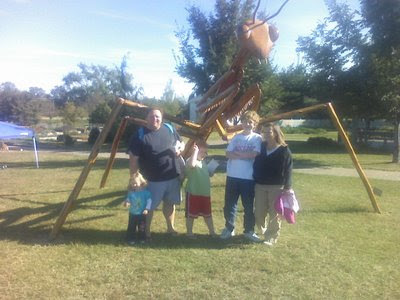 Oh yeah, Owensboro has bugs. Really big bugs. They are cool. For more pics from our YWAM work back home and our recent team we hosted from Canada...GLONK HERE! Leave a comment or drop me a line if you can. 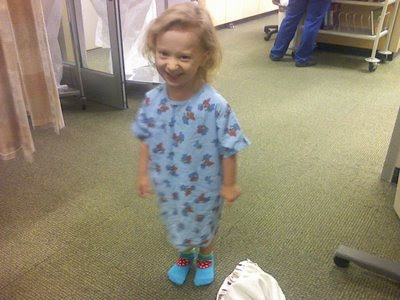 This is the most recent of Stella...right before her ear tube surgery. She did great and is all ready for her trip to Kentucky. She won't stop talking about it..."Daddy, I fly with you to 'tucky?!" 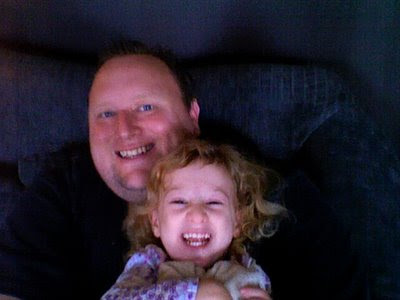 This is Arlie and Dave. Dave was on a team we just hosted from Stanley Park Church in Kitchener, Ontario; Canada and Arlie is from his Hobo shack. 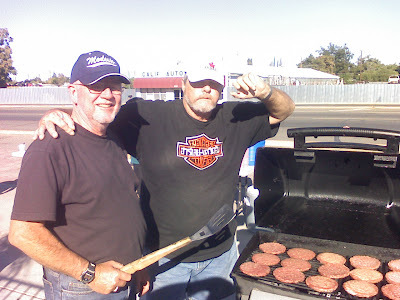 Arlie has on a Canada hat and Dave is sporting a Modesto hat. 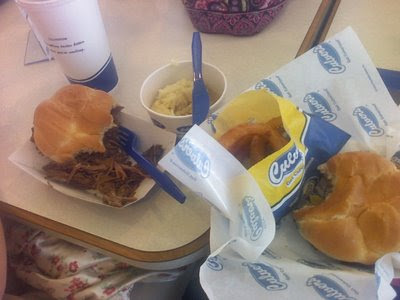 They are both helping to feed to folks of South 9th St. a hot meal. 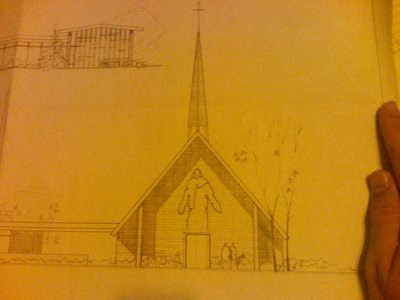 This is the blue print sketch of our new (to us) church building. On the corner of Hadden and Trask in Modesto, this little church was built for a Wesleyan congregation and has been empty for over 4 years. The Canadian team helped us with a lot of clean up in the yard and inside the building. There is quite a buzz in the neighborhood about the new church that's coming. We're really excited! And finally for now...if you ever want to know what kind of town Modesto is...this pretty much sums it up. 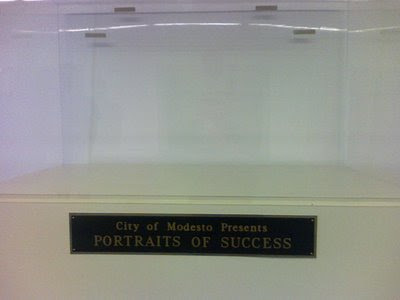 Our portraits of success case in the airport to greet visitors is empty. Wanna see a few more phone pictures? Go to our YWAM Modesto Blog for a few more. 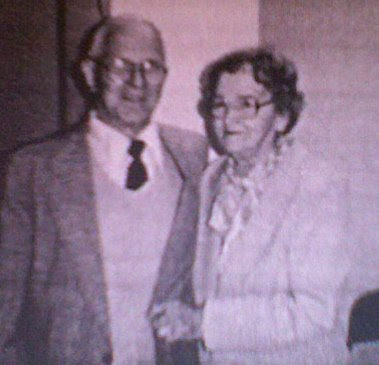 This is a picture of my grandparents. We called them Momo and Popo. Popo was a rigger for Louisville Gas and Electric Company. Momo was his wife. They were happy. They were loving. They lived for their family. They grew a huge garden and shared it with their church. They worshiped in simplicity. They rose early and worked hard all day. They canned food for the winter. Popo watered his garden from the rain barrel...by hand (well into his eighties). They rarely complained and always laughed. I've especially been thinking of Momo lately. She refused to talk politics. She refused to let you know who she voted for on election day. She went to the polls, cast her vote and didn't feel the need to talk about it. In so many ways, we should all be more like Momo.